Note: to reduce the occupied space the sensor components are soldered to short wires and connected directly to the LinkIt ONE board without PCB. IoT assembly kit to take care and find your dog if he get lost. Hugo (that's also the dog dressing the LinkIt ONE kit in these images) means 'U go! and is an innovative device to track and rescue your dog if he get lost. There are situation when also the most calm and reliable dog can be panicked: in a night storm, hiking in the wood alone then loosing the direction to come back to you, coming crazy for the fireworks and many other. Not last the hunting dogs running for km following their prey; it is not rare that then they can't find come back. How can we rescue our best-friend pet? 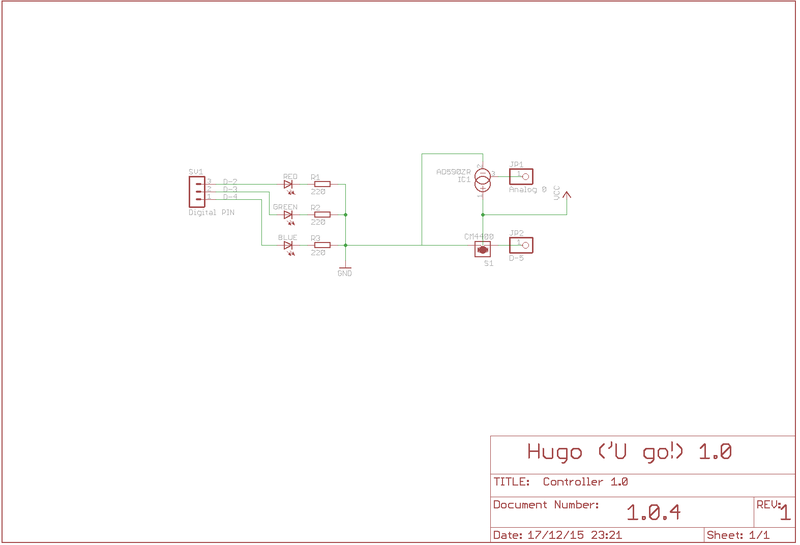 We can, if the dog wears the Hugo device, based on the Mediatek LinkIt ONE board. Hugo is a low-price device kit that can standby for more than a day with a very low power consumption thanks to the optimised software and a reliable hardware; testing on the prototype shows that after 32 hrs of standby the device has worked actively for other two hours before a full battery discharge. Can be enabled from remote via SMS at any distance worldwide. If there is no signal when the command message is sent as the device is again under coverage the last SMS command is received and processed immediately. There is no need of remote Internet connection, no fee to pay per year. The SMS response includes the Google Maps link location that the user can immediately check on the browser on his smartphone, tablet, etc. Software is open source licensed under the Apache 2 license and you can hack it and customise it. The device has been designed thinking to the kind of stress it should support, wore by a dog, maybe running or escaping, eventually scared. The first goal designing the case was making a robust shell, to protect the board and sensors inside from strong solicitations. The shell is 3D printed with ABS filament in three parts (the red ones in the images) plus an optional fourth thick component that can be used to fix the device with four M3 Allen screws to a rigid support. Hugo can be sewed with a strong thin rope like the 1 mm marine rope used in the images (3 mt. are included with the assembly kit). To reduce as much as possible Hugo battery consumption there is only a single RGB LED for board visual information for benefit of the dog owner. The detailed map of the colour coding are shown in the table below. Note that to avoid extra-consumption of power, the visual notifications of the RGB LED can be disabled with the command "Quiet" as well the remote web update can be set to off with the command "Web"
The sensors and LED circuit schematics is attached to the project. To reduce as much as possible the size of the device the extra-components has been soldered and wired directly on the board as shown in the images below. Optionally it is possible to track real-time as well as see the other sensor status and the battery level on the Hugo prototype page of the Mediateck Cloud Sandbox. The image below shows the variables displayed by the prototype. The description of the calls and the variables updated on the web page are documented in the software sources as well as the preset variables for the remote restful API calls to manage the connection. The schematics shows the connections with the LinkIt ONE pin. Power supply and GND are intended to be connected to the 5V and GND pins of the LinkIt ONE. This is the repository of the LinkIt ONE application. check last commit on the master branch to get the most updated version. At the date some meaningful improvements has been added respect the version running in the video. Further enhancements will be added in the next future.